When you purchase a starter guitar you want to make sure that it is in a functional and playable condition. 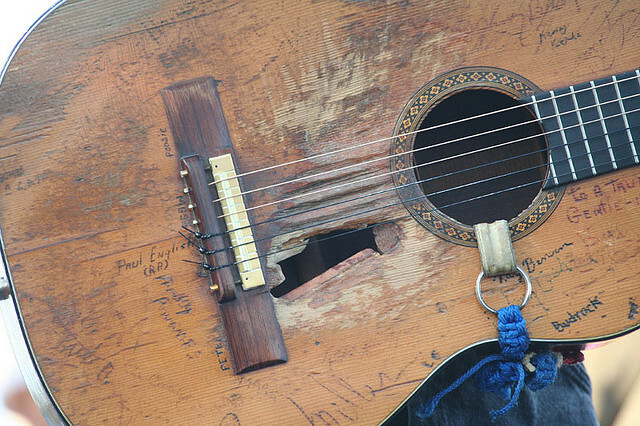 This particularly applies to used guitars, but new guitars can potentially have issues as well. Most of the time, the guitar that you walked out of the door with is not the one that you tried out in the store. So you want to be sure that the one you are getting is in good condition. Intonation: Intonation is how accurate the pitches (notes) are at each fret. When the guitar strings are tuned to standard tuning, all of the notes played at each fret should also be at the correct pitch. The best way to check this is by using a guitar tuner on the chromatic or “all notes” setting and play each fret on every string. Body Condition: Make sure the body of the guitar is in decent shape. Make sure the finish on the body is not cracked in anyway or the bridge is not sinking into the wood (symptoms of the wood drying out). Also be sure that there are no dips or swells in the body (signs of over humidifying). Neck Condition: Make sure that the neck is not warped or twisted in any way. Guitar necks can have a slight bow in them, but make sure it is not bowed too much. Also, be sure that there are no cracks in the neck or headstock. These are some very basic tips on guitar conditions. If you’re buying a used guitar, some superficial cracks or nicks in the wood can add character to the instrument and not affect its playability in any way. Just be on the lookout for the potential issues listed above and you should be in good shape.